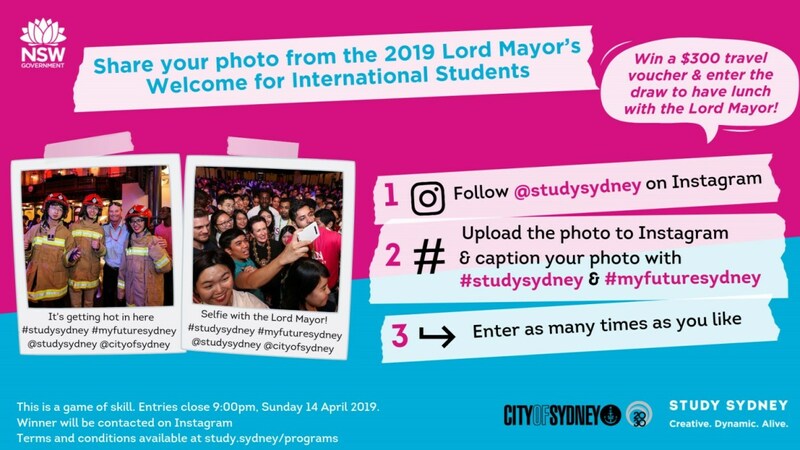 International students across NSW are invited to share their photo on Instagram using #StudySydney. There are various competitions and prizes throughout the year. 1. Your Images: You agree to grant NSW Department of Industry (Study NSW) a free, non-exclusive, worldwide, perpetual and irrevocable license to use, reproduce, distribute, adapt, publish, broadcast, communicate and perform your entry, in whole or in part for any purpose including the Competition. This may include use in promotional formats broadcast to the public such as through a digital feed via NSW Department of Industry (Study NSW) websites, Facebook pages, Twitter accounts and Instagram accounts, and in subsequent competition promotions (with attribution), or printed for physical events by NSW Department of Industry (Study NSW). You will not be entitled to any fee for such use. 2. Original Image: Each entry must be an original work by you and you must have obtained the permission from all persons appearing in Images and relevant property owners to enter this Competition. You warrant that your entry is not, and its use by NSW Department of Industry (Study NSW) will not infringe the rights (including intellectual property rights) of any third party. 3. Game of skill: The Competition is a game of skill, chance plays no part in determining the winner/s and each validly submitted entry will be individually judged by NSW Department of Industry (Study NSW) on the basis of originality, creativity and artistic merit. 4. Binding decision: A decision of the NSW Department of Industry (Study NSW) in relation to the conduct of the Competition, including the selection of winning entries, is binding and conclusive and no correspondence will be entered into. 5. Prizes non-transferable: Prizes are not transferable or redeemable for cash. The prizes, or any element of the prizes, cannot be exchanged for any other prize/s. The contents of the prizes will be at the Study NSW sole discretion. 6. No liability: You enter the Competition at your own risk. With the exception of liability which cannot be excluded by law, NSW Department of Industry (Study NSW) is not liable for, and you release the Study NSW from, liabilities relating to any direct or indirect loss or damage which is suffered, or for personal injury or sickness suffered or sustained, as a result of entering the Competition, failing to win, winning, accepting or using a prize.